India vs Australia 2018-19 Tests: Head coach Ravi Shastri again courted controversy when he compared India's maiden Test series win in Australia to the 1983 World Cup triumph under Kapil Dev. India vs Australia 2018-19 Tests: Head coach Ravi Shastri again courted controversy when he compared India’s maiden Test series win in Australia to the 1983 World Cup triumph under Kapil Dev. This was India’s first win 71 years in Australian soil. Shastri was ecstatic at the press conference and in the moment when he was asked about how he felt about the win, he promptly compared it to the win in 1983 when Kapil Dev led India to its first World Cup win. The idea did not go down well with fans who came down hard at Ravi Shastri and trolled him brutally. Ravi Shastri : This Victory is bigger than World Cup 1983. 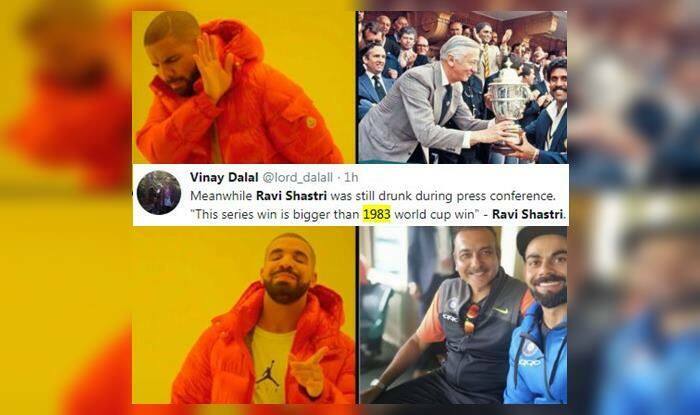 Ravi Shastri taking full responsibility on his head to defame and derespect our cricket legends like kapil, sachin ,dada etc.